For other uses, see Chipmunk (disambiguation). Chipmunks may be classified either as a single genus, Tamias, or as three genera: Tamias, of which the eastern chipmunk (T. striatus) is the only living member; Eutamias, of which the Siberian chipmunk (E. sibiricus) is the only living member; and Neotamias, which includes the 23 remaining, mostly western, species. These classifications are arbitrary,[according to whom?] and most taxonomies over the twentieth century have placed the chipmunks in a single genus. However, studies of mitochondrial DNA show that the divergence between each of the three chipmunk groups is comparable to the genetic dissimilarity between Marmota and Spermophilus., so the three genera classification has been adopted here. The common name originally may have been spelled "chitmunk", from the native Odawa (Ottawa) word jidmoonh, meaning "red squirrel" (cf. Ojibwe, ajidamoo). The earliest form cited in the Oxford English Dictionary (from 1842) is "chipmonk", but "chipmunk" appears in several books from the 1820s and 1830s. Other early forms include "chipmuck" and "chipminck", and in the 1830s they were also referred to as "chip squirrels", probably in reference to the sound they make. In the mid-1800s, John James Audubon and his sons included a lithograph of the chipmunk in their Viviparous Quadrupeds of North America, calling it the "chipping squirrel [or] hackee". Chipmunks have also been referred to as "striped squirrels", "timber tigers", and "ground squirrels" (although the name "ground squirrel" usually refers to other squirrels, such as those of the genus Spermophilus). Chipmunks have an omnivorous diet primarily consisting of seeds, nuts and other fruits, and buds. They also commonly eat grass, shoots, and many other forms of plant matter, as well as fungi, insects and other arthropods, small frogs, worms, and bird eggs. Around humans, chipmunks can eat cultivated grains and vegetables, and other plants from farms and gardens, so they are sometimes considered pests. Chipmunks mostly forage on the ground, but they climb trees to obtain nuts such as hazelnuts and acorns. At the beginning of autumn, many species of chipmunk begin to stockpile nonperishable foods for winter. They mostly cache their foods in a larder in their burrows and remain in their nests until spring, unlike some other species which make many small caches of food. Cheek pouches allow chipmunks to carry food items to their burrows for either storage or consumption. Eastern chipmunks mate in early spring and again in early summer, producing litters of four or five young twice each year. 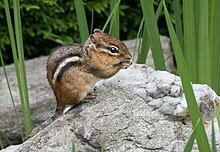 Western chipmunks breed only once a year. The young emerge from the burrow after about six weeks and strike out on their own within the next two weeks. 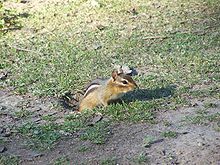 Chipmunks construct expansive burrows which can be more than 3.5 m (11 ft) in length with several well-concealed entrances. The sleeping quarters are kept clean as shells and feces are stored in refuse tunnels. The eastern chipmunk hibernates in the winter, while western chipmunks do not, relying on the stores in their burrows. Chipmunks play an important role as prey for various predatory mammals and birds but are also opportunistic predators themselves, particularly with regard to bird eggs and nestlings, as in the case of eastern chipmunks and mountain bluebirds (Siala currucoides). Chipmunks typically live about three years although some have been observed living to nine years in captivity. Chipmunks in captivity are said to sleep for an average of about 15 hours a day. It is thought that mammals which can sleep in hiding, such as rodents and bats, tend to sleep longer than those that must remain on alert. ^ Illigeri, Caroli (1811). "Genus 34. Tamias (ταμιας promus condus) Bakkenhörnchen". Prodromus systematis mammalium et avium. Berlin: C. Salfeld. p. 83. ^ Wilson, D. E.; D. M. Reeder (2005). "Mammal Species of the World". Archived from the original on 2007-06-23. Retrieved 2007-06-27. ^ Piaggio, A. J.; Spicer, G. S. (2001). "Molecular phylogeny of the chipmunks inferred from mitochondrial cytochrome b and cytochrome oxidase II gene sequences" (PDF). Molecular Phylogenetics and Evolution. 20 (3): 335–350. CiteSeerX 10.1.1.330.9046. doi:10.1006/mpev.2001.0975. PMID 11527462. ^ Piaggio, Antoinette J.; Spicer, Greg S. (2000). "Molecular Phylogeny of the Chipmunk Genus Tamias Based on the Mitochondrial Cytochrome Oxidase Subunit II Gene" (PDF). Journal of Mammalian Evolution. 7 (3): 147–166. doi:10.1023/a:1009484302799. ^ Musser, G. G.; Durden, L. A.; Holden, M. E.; Light, J. E. (2010). "Systematic review of endemic Sulawesi squirrels (Rodentia, Sciuridae), with descriptions of new species of associated sucking lice (Insecta, Anoplura), and phylogenetic and zoogeographic assessments of sciurid lice". Bulletin of the American Museum of Natural History. 339 (339): 1–260. doi:10.1206/695.1. hdl:2246/6067. ^ "Online Etymology Dictionary". Etymonline.com. Retrieved 2012-12-07. ^ Nichols, John D. and Earl Nyholm (1995). A Concise Dictionary of Minnesota Ojibwe. Minneapolis: University of Minnesota Press. ^ "Google Books". Retrieved 2012-12-07. ^ Audubon, John James; Bachman, John (1967). Imperial Collection of Audubon Mammals. New York: Bonanza Books, a division of Crown Publishing Group. p. 52. ^ a b c d e f Hazard, Evan B. (1982). The Mammals of Minnesota. University of Minnesota Press. pp. 52–54. ISBN 978-0-8166-0952-9. ^ a b c "West Virginia Wildlife Magazine: Wildlife Diversity Notebook. Eastern chipmunk". Wvdnr.gov. Retrieved 2012-12-07. ^ "Eastern Chipmunk - Tamias striatus - NatureWorks". Nhptv.org. Retrieved 2012-12-07. ^ Linzey, A.V. ; NatureServe (2008). "Tamias minimus". IUCN Red List of Threatened Species. Version 2012.1. International Union for Conservation of Nature. Retrieved 2012-08-29. ^ Linzey, A.V. ; NatureServe (2008). "Tamias sibiricus". IUCN Red List of Threatened Species. Version 2012.1. International Union for Conservation of Nature. Retrieved 2012-08-29. ^ Linzey, A.V. ; NatureServe (2008). "Tamias townsendi". IUCN Red List of Threatened Species. Version 2012.1. International Union for Conservation of Nature. Retrieved 2012-08-29. ^ "Chipmunks | Living With Wildlife". Mass Audubon. Retrieved 2012-12-07. ^ "Chipmunk at Animal Corner". Animalcorner.co.uk. 2004-01-01. Retrieved 2012-12-07. ^ Schwartz, Charles Walsh; Elizabeth Reeder Schwartz; Jerry J. Conley (2001). The Wild Mammals of Missouri. University of Missouri Press. pp. 135–140. ISBN 978-0-8262-1359-4. ^ Apostol, Dean; Marcia Sinclair (2006). Restoring the Pacific Northwest: The Art and Science of Ecological Restoration in Cascadia. Island Press. p. 112. ISBN 978-1-55963-078-8. ^ Saunders, D. A. (1988). "Eastern Chipmunk". Adirondack Mammals. Adirondack Ecological Center. Retrieved 2015-09-19. ^ Leslie Day (October 2007). Field Guide to the Natural World of New York City. Johns Hopkins University Press. ISBN 9780801886829. Retrieved 2015-09-19. ^ Kays, R. W.; Wilson, Don E. (2009). Mammals of North America (2nd ed.). Princeton University Press. p. 72. ISBN 978-0-691-14092-6. ^ Sullivan, Janet. "WILDLIFE SPECIES: Sialia currucoides". Fire Effects Information System, [Online]. U.S. Department of Agriculture, Forest Service, Rocky Mountain Research Station, Fire Sciences Laboratory. Retrieved 23 January 2016. ^ "Information on Chipmunks". Essortment.com. 1986-05-16. Retrieved 2012-12-07. Baack, Jessica K. and Paul V. Switzer. "Alarm Calls Affect Foraging Behavior in Eastern Chipmunks (Tamias Striatus, Rodentia: Sciuridae)." Ethology. Vol. 106. Dec. 2003. 1057–1066. Wikimedia Commons has media related to Tamias.